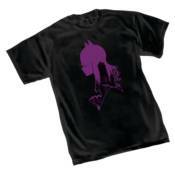 Batgirl shows her best side on the new Batgirl: Silhouette T-Shirt. Imprinted in color on a black, heavyweight shirt. Also still available in both women and men's styles is the Batgirl Symbol. NOW AVAILABLE for sale in Canada and U.K.